Vanille Galante has a misleading name. It is many things, but a vanilla fragrance it is not. Which, frankly, put me off it for a long time. I may be too literal a person, but my expectations and the perfume itself were so far from each other that I pouted and left it in the back of my closet, unloved and unworn. Even I can not hold a grudge this long though (at least not with a perfume, with people I am like an elephant, I never forget), so I got Vanille Galante out of purgatory for another run. And lo and behold – it is quite interesting. NOT vanilla, certainly, but a unique and mighty strange floral. 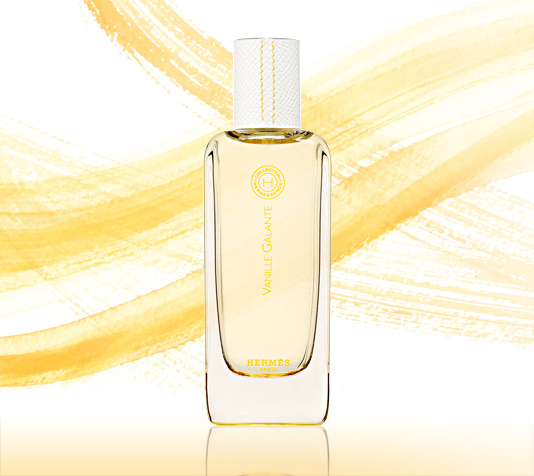 Vanille Galante features notes of ylang ylang, green notes, spices, lily, salicylates, sandalwood and vanilla. It was created by Jean-Claude Ellena in 2009. Then it develops into a lily fragrance. I smell wide open petals, a certain spiciness and saltiness often present in lily, a little ylang-ylang, green stems, sitting in water that has not been changed in a few days. What comes to mind is a vanilla orchid, the flower part of the plant that gives us vanilla pods. Light yellow, pretty, but very exotic and unapproachable it sits there and judges you. Vanille Galante is easily the one with the strongest sillage and the strongest character of all the Hermessences I have tried (I am missing only Brin de Reglisse (Update: no longer true 🙂 ) and Paprika Brasil). And while it has a lot of diffusive, statement making power, it is still a recognizably Ellena creation in the sense of its transparency and light-flooded airiness. What sounds like a contradiction when written down, is clear as day once you smell it. It is large, all around you, but almost invisible. It feels like being inside a giant cheese cover (don’t take this metaphor olfactorily! ), it is invisible, but you are surrounded. Vanille Galante reminds me in smell of Frederic Malle Lys Mediterranée and Serge Lutens Un Lys, but in execution they are light years apart. It is like comparing a soap bubble to a piece of wood and a stone, respectively. In the late drydown there is a hint of actual vanilla, but it is a mere puff, that makes you believe it might just be wishful thinking after all. Do I love Vanille Galante? No. But I am immensely impressed (once more) by the skills of its creator, to make such heavy floral notes, that hit you over the head almost in other perfumes, into something so gossamer thin and barely there in weight, while retaining their distinct smell. It is like he kept the substance of the flowers but took out their mass. Like astronauts, the flowers hang there in front of my nose, gallivanting in space, weightless, gravitation-less and free. For that reason alone, Vanille Galante is worth a sniff. Of all the Hermessences it is not the most wearable for me, but the most interesting by far. Vanille Galante engages my curiosity and my sense of wonder. This entry was posted in Floral, Fragrance Reviews, Hermès and tagged floral, Fragrance, Hermes, Hermessence, Jean-Claude Ellena, Lily, Perfume, Review, Vanilla, Vanilla Scents, Ylang-Ylang. Bookmark the permalink. Your closing line about the place of VG in the Hermessences range is exactly what I thought when I smelled the line. Not very wearable but most interesting. The most photorealistic execution of the scent of a tiger lily, it should actually be called “Lys réfrigéré” as it smells exactly like a florists refrigerator full of lilies and it exudes the same coolness. The vanilla is not of the natural variety but rather the artificial peppery vanillin subrtitute, which is fine by me because it doesn’t have any gourmand sweetness. And this peppery vanillic note is also present in the flower’s smell. Lys Refrigėrė would be an excellent name for VG. Well, I haven’t tried all the Hermessences, but so far, Vanilla Galante is my favourite. Even though like you said, it’s not really vanilla in the strict sense, it’s quite green on me. And the weightlessness is something I’ve been wondering about. Very sheer for a vanilla perfume but present and lasting nevertheless. I like the idea of VG, but it irritates me when wearing it. I was just thinking about you, because I am wearing the Penhaligon’s Artemisia just now that you sent. How do you like it? I love Artemisia! I don’t seem to wear it a lot anymore but when I bought it I wore it all the time (and now there’s not much left in the bottle). The strange thing is, I cannot wrap my mind around it and figure out what exactly is in there that makes it so likeable for me. Very interesting, I was sure you would like this knowing you are a fan of a couple of lily fragrances. Loved the space analogy and the line “it there sits and judges you” lol! That’s enough to put me off, along with the banana you picked up (which makes perfect sense as there’s ylang-ylang in there). I’ve only tried Ambre Narguile, but all the Hermessences sounds so unique and well worth a sniff, as you say. I’ve just got to pluck up the courage to deal with those snooty Hermes SAs! I really like Vanilla Galante. As I often do, I sampled it without re-reading the notes (I read them when I get samples, but by the time they arrive, I’ve forgotten everything!). I was surprised to find a floral and not a gourmand. Once the stunned look dropped off of my face, I realized I was quite enamored. On the other hand, I was expecting an amber monster with Ambre Narguile, and found a sweet amber-pastry—and was very pleased with it! I’ve not tried this, but loved your review and comparison to the astronauts hanging out in space! Like Tara said, judging by the notes and even by your description (plus the fact that you love JCE creations), I would have thought this one would be right up your alley. Remarking on what Dee said, depending upon what it combines with, ylang often reminds me of banana too…but in a good way. A very soft and natural way. I like the ylang-banana connection too! Like you I must say I admire and appreciate VG but I don’t LOVE it. To me it smells greeen and very much lily. It’s like when you have a vase vith tall lilies in the room and the scent is intense and heady almost narcotic? I wear VG occasionally but not on days with a budding migraine… My family (mother,brother,sister-in-law) found it too intense, but my father thougt I smelled “like A Lady”! Ambre Nargilé I adore it’s so warm comforting on a cold and rainy day. I love a vase full of lilies in my living room, but wearing it is another thing. 😉 There are many Hermessences I prefer.